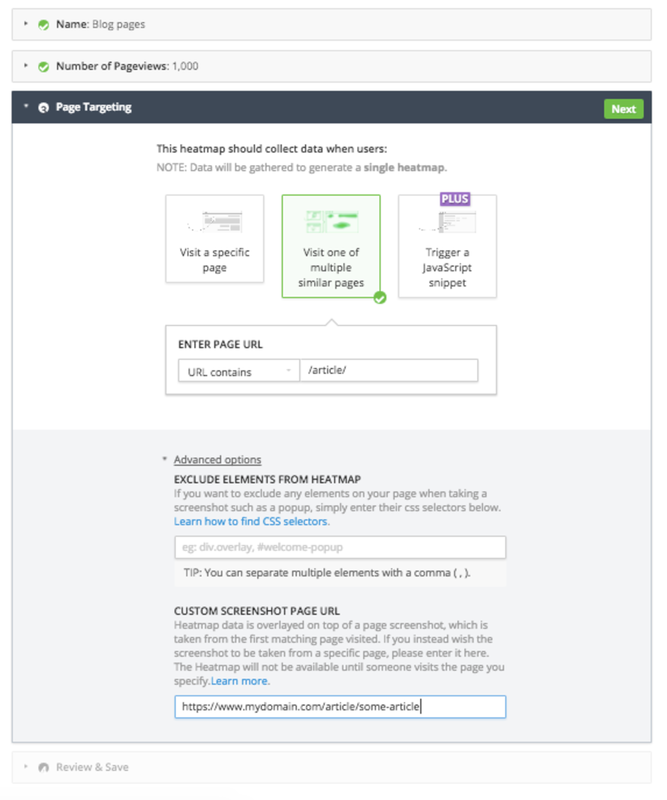 When targeting multiple pages, Hotjar does not have a proper full URL to target, but a pattern to match URLs with. This means that the first matching page which a visitor reaches will be the page used to generate the screenshot for the Heatmap. In some cases, it's preferable to decide which page to use for the screenshot. The Custom Screenshot Page URL field is used for this reason to tell Hotjar which URL the screenshot should be taken. The most common uses are for Delaying Screenshots and choosing which URL you would like to show in your multiple page Heatmap. If the Custom Screenshot Page URL isn not within the page targeting rules of the Heatmap, no screenshot will be taken. The Custom Screenshot Page URL will need to be visited before any screenshot or data show up on the Heatmap. Looking for screenshot troubleshooting help? If your screenshot has already been taken and doesn't match your live site, you can retake the Heatmap within the Hotjar app or look read our Troubleshooting Guide. This user would like to create a Heatmap of all of the articles on their blog. To do this, they select Visit one of multiple similar pages and set the page targeting to Contains: /article/ in order to generate a Heatmap for all of the articles on the blog. Then, they specify a URL by clicking the Advanced Options link and filling in the Custom Screenshot Page URL field. The Custom Screenshot Page URL should be a URL of one of our articles. They chose to take a screenshot of https://www.mydomain.com/article/some-article. After creating the Heatmap and visiting the Custom Screenshot Page URL, their Heatmap begins to show data.